Have you mentored anyone lately? CFM members are active and engaged outdoors people. Whether you like to hunt, fish, camp, bike, or any one of hundreds of other available outdoor opportunities, we know how to get it done. Our outdoor skills weren’t something that we were born with though, each of us had a mentor to show us the ropes and help us get to where we are today. I grew up on a farm in Pike County with ample opportunities to hunt, fish and camp, (once the chores were done). We had a large spring-fed creek on the property with plenty of panfish and bullheads to catch. The woods were teeming with deer, turkeys and squirrels. I ran trap lines in the winter to make extra spending money. For a certified country boy, it was like growing up in paradise. It wasn’t until I grew older that I really thought about the amount of instruction I had received in outdoor skills from my Dad and Grandfather. Without them as mentors, I wouldn’t be able to read sign left by game animals and fur bearers and know where to set my trap or hang my tree stand. I spent hours on the Mississippi river with my Grandfather learning how to set trout lines. He made each line box by hand, with grooves cut to hold each hook, keeping them from tangling. He taught me how to run a seine up a creek for bait before we headed to the river. His first Jon boat was a leaky wooden affair and I quickly learned the importance of bringing an old coffee can to bail water. He showed me how you needed to read sign on the river, just as you would in the woods to set your lines in the best spot to catch a big flathead. Although we no longer farm for a living, I’ve tried to pass my love for the outdoors on to my children and grandchildren. My son still tries to make it home for deer season and he spends lots of time fishing and boating with his children. My daughter, never much on hunting, is an avid kayaker, along with her husband. He loves to hunt and fish and since their move to Michigan, has started to learn how to ice fish this winter. Their children are Kayakers as well and the whole family enjoys exploring new streams and lakes together. As CFM members we owe it to the next generation to pass on our love for the outdoors, as well as teaching good stewardship and wise use of our resources. We should be actively looking for mentoring opportunities, not only with family, but others who otherwise wouldn’t have the chance to enjoy the outdoors. With young people increasingly insulated from nature, absorbed in video games and social media, it is more important than ever to give up some of our time afield to take someone under our wing and show them the wonder that is all around us. 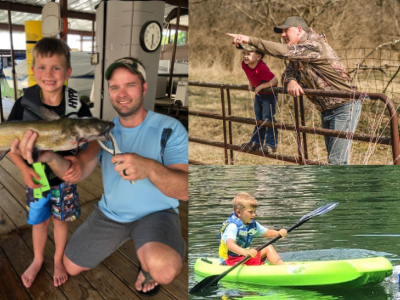 It may mean we have to give up a day of fishing or hunting, but if we don’t get involved and bring up the next generation to respect nature and our environment, there will be no one to speak for the future of our natural resources and the rich outdoor heritage we Missourians enjoy. If you’re concerned about taking on the task of being a mentor yourself, there are plenty of resources available to help. Bass Pro Shops has a number of events each year that give kids a chance to catch their first fish, or learn an outdoor skill. The Missouri Department of Conservation has workshops throughout the state to help novice outdoors people learn new skills. You can find more information about dates and times at their respective web sites. Spring is almost here. Be sure to get outside – and take someone with you.